Normally I'm the type of girl who wants allllll the neutral things, no matter the season. But, moving to LA this month means I've been missing out on a whole New England season of colorful fall leaves. So, when Q Squared asked me to style one of their new sets for fall, the Bistro Collection, I was excited to jump out of my neutral comfort zone while also bringing a heavy dose of color back into my fall. The Bistro Collection may be a simple design, but don't let that fool you. The collection's bright colors (red, yellow and blue) are guarenteed to add a pop of fun and excitement to any table. While a single color place setting looks great on its own, the colors and sizes (this set comes in dinner plate, salad plate and cereal bowl), are all great for mixing and matching. 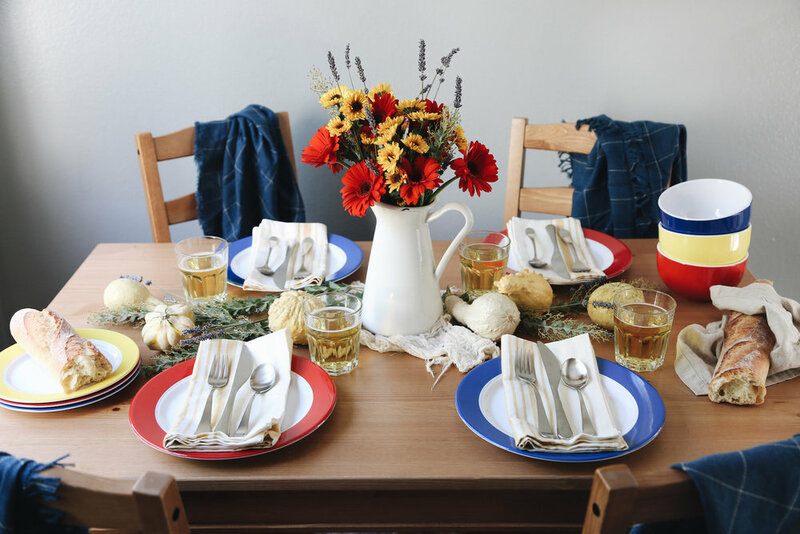 Last but not least, no fall table setting is complete without pumpkins. For the same reason I mentioned above, I chose to select ones in white/off-white colors, then, simply arranged them throughout my floral table runner. 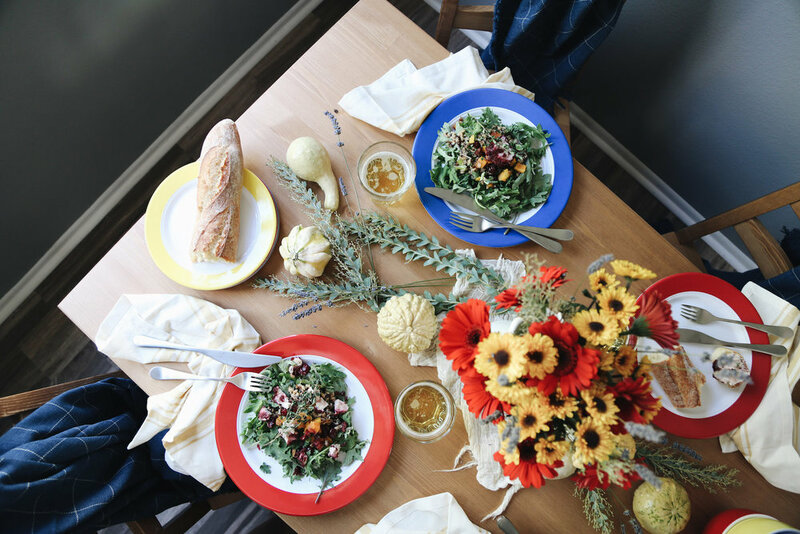 To achieve this colorful farm-style table setting for fall, I first selected an assortment of bright fall flowers inspired by the colors of the Bistro Collection. There are so many flowers that work well in this situation, so you should have no problem finding some at your local flower shop. I recommend getting something red, something yellow, something neutral/pale green (eucatlypus, wheat, cotton stalks, etc) and a grey/purple flower (I chose lavendar). I then made a centerpiece arrangement as well as used the more neutral options to create a table runner of sorts. Because the table setting and flowers are so bold, it's important to keep many of the other elements neutral and a bit rustic to achieve a farm-style look. Think white pitcher with a little wear and tear as a vase, a piece of off-white cheesecloth as the place setting for said vase, off-white linen napkins with a subdued yellow stripe, simple silverware, sturdy clear glasses, subtle blue flannel blankets draped over the backs of each chair, etc. While this farm-style table setting is perfect for many things (a cozy chili night, a fall Mexican fiesta complete with enchiladas and chips & salsa, a weekend brunch gathering...), I showcased it with a menu as simple as the design of the dishes- a harvest salad complete with hearty grains, butternut squash, cranberries, fresh thyme and cranberry goat cheese on a bed of baby kale alongside a loaf of French bread and more of that cranberry goat cheese (Because why not?!). The Bistro Collection will be available on Novemeber 1st, along with a few other new collections from Q Squared. But in the mean time, hop on over to shopQsquared.com and check out all their other great pieces. They have a lot of fun and beautiful designs that all look high-end lux, but everything is actually melamine making them nice enough for entertaining but easy enough for everyday life. Thank you to Q Squared for partnering on today's post.